In this post, were going to compare the similarities and differences between Amazon PPC and AdWords. If you’re an online advertiser there’s a lot to be learned when comparing the two advertising platforms. Amazon PPC professionals can uplevel their knowledge about Amazon advertising and AdWords. AdWords professionals can do the same and bridge their skills when thinking about taking on Amazon PPC. Regarding product search, Amazon beats Google as a search engine. Fifty-five percent of online shoppers begin their search on Amazon. This is because Amazon customers are further down in the sales funnel. Compared to AdWords customers who are most likely in the research phase of buying a product. "The answer to the question, 'What worries you when you go to bed at night and wake up in the morning?' isn't a 3-month-old child. It's Amazon — which is a child but not three months." Sorrell is leader of the agency WPP, an advertising giant. Sorrell is often in the news, providing insight on hot topics in advertising and has served as WPP’s CEO since 1985. Sorrell has seen just about every digital trend in advertising for the last 30 years and adapted to make WPP the biggest advertising company in the world. Sorrell’s wife just had a baby daughter and when asked what keeps him up at night he says it’s not his daughter, but Amazon. WPP revealed their biggest media partner is Google. Last year, WPP invested $2.9 billion of its $75 billion media bookings into Google ads and with Amazon threatening AdWord’s relevance, Sorrell is worried about adapting once again. Many Google Adwords experts (like Martin Sorrell) are now realizing the effectiveness of Amazon PPC ads, where the customers are at the bottom of the funnel and the conversion rates are sometimes 10x higher. "Despite the seemingly high purchase intent of product searches on Google, paid search conversion rates still only hover around the eCommerce site average of 2%. If you break it out by campaign, branded search campaigns will see the highest conversion rates between 5 and 10%, shopping campaigns between 4 and 8%, and non-brand search campaigns between 1 and 3%. Ryan is a Digital Marketing Freelancer and has been a part of San Diego's top digital marketing agencies. At Ad Badger, our users saw an average conversion rate of 10% for their Sponsored Product Ads in the last 4 months. This should speak volumes to the importance of selling on Amazon in your eCommerce strategy. Not speaking gibberish here. Amazon advertising is the future. The eCommerce store has unlimited advertising potential and have even branched away from eCommerce products. Amazon has a robust publishing and streaming service and has ventured into experimentation into local marketing services, leaving its advertising wide open to possibilities. It’s a hot topic nowadays to discuss the possibility of Amazon’s ad business disrupting the Facebook and Google ad duopoly. Digiday reported Amazon’s ad business is actually growing faster than Google’s and Facebook’s. Facebook has been under fire for manipulating consumer data to the advantage of third parties. Marketers have stressed the importance of eCommerce as an important discipline in their industry for several years. Amazon attracts many sellers because it’s so consumer-focused and proven to make profit. Before you dive into the details, here is a condensed version of this post in an image. Below dives deeper into each similarity and difference. Now that I have explained that Amazon is the new ad platform to be on, I want make a point to say it doesn’t require a whole new set of skills. If you’re well versed in AdWords you are equipped for Amazon PPC ads. Amazon PPC is heavily inspired by AdWords. Amazon is actually a lot easier than AdWords. For now, there’s fewer options, lower competition, and higher conversion rates than AdWords. What Are the Amazon Ad Types? Both Amazon PPC ads and Google’s AdWords ads are created to promote products and increase conversions. But, before we go into the similarities, let’s go over the differences. Google’s ads usually take you to a branded landing page and Amazon’s ads will never take you off of Amazon. Right now Amazon ads don’t capture audience based or behavioral information to retarget. All types of Amazon ads aren’t available to every type of seller. There are specific types available to first-party and third-party sellers. In the Search Engine Results Page (SERP), AdWords ads appear before the organic results. On Amazon, Headline Search Ads and Sponsored Product Ads are seen above the organic results to the right. Comparatively, AdWords does the same thing on Google’s SERP. I’m the type of Badger that’s in love with Sponsored Products Ads, but can see why advertisers love Product Listing Ads. Product Listing Ads show up to the right of organic listings. Sponsored Product Ads can also appear above or below organic listing pages or on product detail pages. Sponsored Product Ads on Amazon look very similar to Ad and usually have the brand name, price, rating, and shipping info on an ad. Search Text Ads appear above organic listings and are text heavy with no images. Similarly, Headline Search Ads appear above organic listings in Amazon and are the only types of ads that require some copywriting. Compared to Amazon Product Display Ads that are kind of last ditch efforts to sway a customer away from your competitor or show a customer a related product. When creating a Product Display Ad on Amazon, you can target a specific product or relevant category. Now, let’s look at how Google and Amazon rank these ads. Amazon and Google have different goals in mind when ranking ads. Because Google and Amazon customers are in different stages of the sales funnel, Amazon tries its best to convert and Google tries to grab attention. "The biggest differences I see between Amazon PPC and Adwords is that Amazon is focused on sales and bottom funnel customers and AdWords is more of a one stop shop to catch customers at every step of the sales funnel (brand awareness, retargeting, getting subscribers, making sales, promoting new products, etc)." Kyle helps businesses create their online presence through the most powerful channels available: Amazon, Google, Facebook, and Bing. Google prioritizes Click-Through-Rate (CTR). CTR is how Google decides what a quality ad is. AdWords reward the most clickable ads because that’s how Google makes its revenue. Since AdWords’ advertisers have to pay for every one of their ads that are clicked on, Google further incentivizes to serve that ad more often. Here’s an example of an Ad Badger AdWords ad that reaches the top of the SERP. We love all PPC, we don’t discriminate. Amazon wants to rank ads based on which one the customer is most likely to buy from. They don’t use the term “Quality Score”, but they use the same idea and base ad rank of off performance and relevance metrics. Typically, the relevance metrics create great performance metrics. Product pages are important to ad rank because they influence conversions and overall sales. Here’s an example of a great product page. Users are more likely to buy from this seller because they have plenty of images, a decent rating, and a great description. Amazon ranks ads on all these things. Because both Google and Amazon take into account the quality of an ad and whether or not the ad fits their agenda, it’s hard for a big company to take all of the ad space. With their ad ranking formula in place, companies can’t expect to increase visibility just by bidding higher than their competitors. This prevents ad monopolies. Broad Match: Bids on keywords that are broadly related to your product. This keyword type sees more long tail keywords, are less competitive and cheaper. Phrase Match: Bids on keywords that appear in search phrases a customer types in. These are more specific than broad. Exact Match: Bids on keywords that are really specific to your product or brand. These keywords are competitive and more expensive. Modified Broad Match: Think of this keyword type as an in between of Broad and Phrase. This type can bring in more qualified traffic. AdWords users simply place a “+” in front of a Broad Match keyword they wish to modify and their product will appear for misspellings, singular/plural forms, abbreviations, and acronyms of that word. It simply makes Broad Match more specific. AdWords vs Amazon PPC be like. The bidding works exactly the same: Users bid on keywords in an auction-style system. In both Amazon and AdWords there is an auction style system based on CPC and ad quality as described above. There are simple, intermediate, and advanced ways to optimize bids. The simplest way to optimize bids is to change them manually. AdWords and Amazon PPC ads both have these options. When you log into an ad platform, bids don’t change unless you change them yourself. This is a double edged sword. As an ad account grows, it can take up tons of time and it’s very difficult to bid accurately. Additionally, Amazon has Bid+, twin to AdWord’s Enhanced CPC. Both of these assist your ads by increasing visibility by bidding higher on keywords that each platform chooses. The benefits of this is that you can gain more traffic for certain terms. 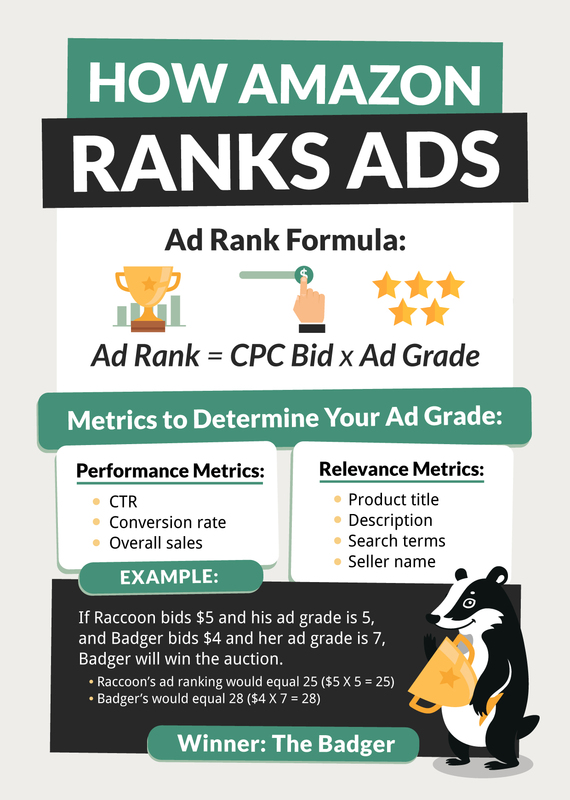 The downside is this assisted bidding is not well optimized to hit your Target ACoS, which is why the most successful advertisers use advanced bidding strategies. The most advanced bidding an advertiser can do is bid with an automated solution that focuses on your ROI. Both AdWords and Amazon PPC were created so advertisers can easily launch ads. An individual advertiser’s ROI typically comes second to profit in their eyes. AdWords support is notorious for suggesting new ways to get more click and spend more money without asking what their target cost-per-sale is. This is why automated bidding software exists–to put the focus back on profit. On AdWords, the most advanced advertisers are using Optmyzer, DoubleClick, Acquisio. On Amazon, I’m a bit biased, but I believe we have the most accurate and most advanced bidding system to hit your Target ACoS. By automatically updating your bids based on your changing conversion rates is the most advanced bidding can get. Google’s PPC infrastructure is a thing of beauty. There’s a reason it’s so popular and is essential for businesses to drive traffic. Amazon’s infrastructure is not so good–yet. Marketers and entrepreneurs are just now realizing the potential of Amazon advertising. As Amazon’s ad business continues to grow, it will keep taking more inspiration from AdWords. I predict Amazon will implement more advanced targeting such as day parting and audience types. Day Parting – Scheduling your ads to appear a specific times of the day to get the most value out of them. This would be a nice feature for Amazon sellers to zero in on audiences. Audience Targeting – Amazon’s audience targeting is elementary compared to AdWords. With AdWords, users can target audiences demographically, by category interests, or remarketing lists. Amazon has made an effort with audience targeting, but I expect they will try to copy AdWords in the future. Now you know the similarities and differences between Amazon PPC and Google’s AdWords and you can take on the future of online advertising. The similarities between these two platforms is very visible and advertisers can expect even more similar features in the future. Lastly, here’s a video of Mike recapping the post if you’re not into reading or skimmed. Whoo! This was a lot of information. For more Amazon PPC education visit our blog.